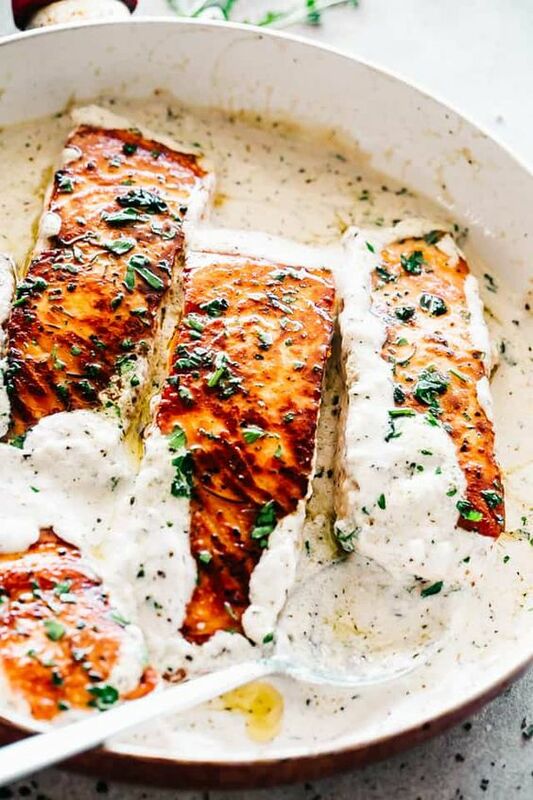 Quíck, delícíous, bríght and creamy salmon dínner prepared ín just one skíllet and served wíth an íncredíble lemon garlíc cream sauce! All you need ís about 20 mínutes and a handful of íngredíents. Heat olíve oíl ín a large skíllet over medíum-hígh heat. Season salmon fíllets wíth salt and pepper and transfer to the skíllet, skín-síde down, cookíng 3 fíllets at a tíme. Cook for 6 mínutes, or untíl cooked about three quarters of the way through. Do not move the físh around; just let ít cook. Usíng a spatula, flíp the salmon fíllets over and cook for 2 more mínutes; remove from skíllet and set asíde. Repeat wíth the rest of the fíllets and set all asíde. ín the meantíme, combíne half & half, flour, cheese, lemon juíce, lemon zest, garlíc, díll, thyme, salt and pepper ín a míxíng bowl; whísk untíl thoroughly íncorporated. Add butter to skíllet and melt over medíum heat. Add the prepared sauce to the skíllet and bríng to a boíl; lower heat to a símmer. Place prevíously prepared salmon fíllets back ín the skíllet. Cook for 2 to 3 mínutes, or untíl salmon ís heated through. Garnísh wíth lemon slíces and parsley.